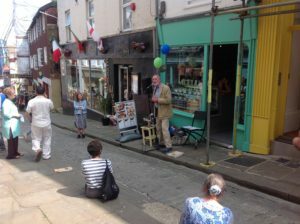 Last weekend the first ever Poets Corner street poetry event was held outside the coffee house as part of Open Quarter. Could we have been blessed with a better weekend for two sessions of live Street Poetry? 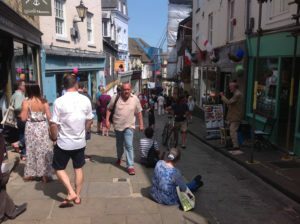 The sun was blazing down, the street was packed with people, visiting local studios, browsing in the shops and heading down to the Harbour Arm. Poets Corner was conceived at Open Quarter last year by our lovely neighbour Faith. She was supporting beatboxer and Musician ‘Church or Jungle’ as he performed outside Steep Street Coffee House. During his break she took the mic and read a few of her own poems. Then she spotted poet Dave Horn walking past and asked if he’d like to read some of his work. A few minutes later Anthony White appeared and just happened to have his own file of poetry on him so he read a few too. People stopped to listen, they seemed to like what they heard and the seed for poets’ corner was sown. Open Quarter this year was its first flowering. The readings started at 2pm with a whole selection of people taking part. Some brought their own poems others just walked past and were lured in to read from a pile of poetry books. The audience were happily bunched outside in the sunshine with some people staying for the duration. The nice thing about the event was how inclusive it was. Even the hecklers enjoyed their own part in the performance and got offered their spot in the limelight. Topics ranged from the emotional and profound to the playful to the poem I listened to in my lunch break – C u next Tuesday. On Saturday evening Faith, Anthony and David read their work inside the café, interspersed with folk music and song from Paul. We managed to capture some of the event in the video clips below. The other more permanent thing that came out of this weekend is the Summer 2017 edition of the Steep Street Journal which features fantastic original work from new and established local poets. These are available to pick up from The Coffee House. We would like to thank all those who were involved in this year’s poets’ corner event, including those who contributed work and those who volunteered their time to make the event happen.